The Importance of Spring Clean Ups and Storm Damaged Tree Care. It is hard to believe that spring is right around the corner, especially with the mass of snow that we have received this winter. But all of this snow makes it even more important to have a plan on how you are going to handle your spring clean-up and tree inspections. Accurate Tree Service wants to know… What do you normally do? Do you have a spring cleanup routine? Do you have trees that are on your property that experienced some damage this year? If so, what do you do? Do you leave hanging limbs, sometimes known as “widow makers” hung up in other trees on your property, or do you take them down? Do you hire someone or do you try to do it yourself? We would love to know! The heavy snow, strong winds, and damaging ice that we have had so far have done a number on the trees in our area. In addition, we are still seeing some remaining tree damage from the Ice Storm that New Hampshire experienced a few years ago and also the Wind Storm that tore through the state. Some of the things that you as a homeowner should look out for are damaged trees, hanging limbs and uprooted trunks. These are all large areas of concern as they pose a strong safety risk to you, your family and anyone that may enter your property. Did you know that you are responsible for limbs hanging over your property even if the trunk of the tree is not on your property? 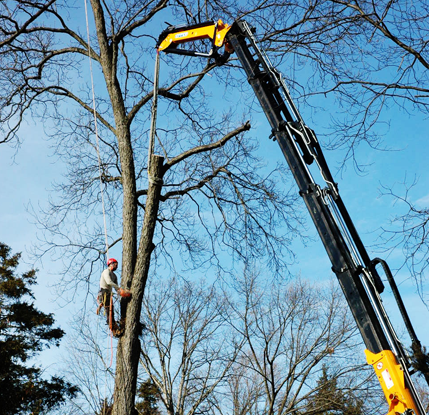 This is one of the most frequently asked questions that we have at Accurate Tree Service. It is your responsibility as a homeowner to ensure that the trees and limbs on your property are safe, and that includes an invisible vertical line up your property line. If a limb that was damaged and hanging over your property were to fall off of your “neighbor’s tree” you could be held liable for any injury or damage. If you have young children at home or living in your neighborhood, it is especially important that you know what is on your property and the condition of your trees. It will be important to address any areas of concern. If you have any signs of tree damage or hazardous trees on your property you should consider your options for eliminating these dangers. You do not want to wait until it is too late.